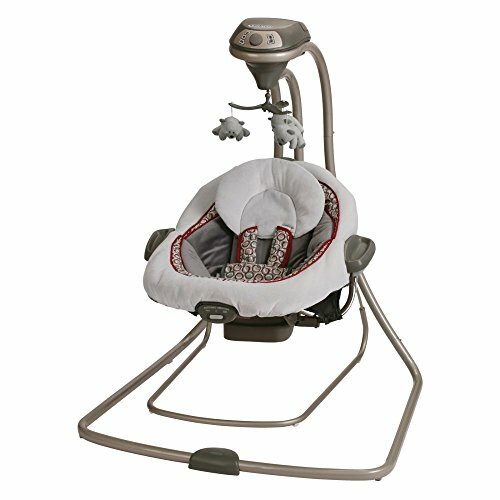 Your baby will love swinging gently in the comfortable Graco DuetConnect Swing LX - Finley. Able to double as a bouncer so you have the flexibility to move around the house while keeping your baby nearby, you'll love that you don't have to continually disturb your baby when you need to go into a different room. Complete with six different swing settings, 10 melodies, five nature sounds, two vibration settings, and a mobile with three toys you'll be able to find the perfect combination to soothe and entertain your little one. You also have the option of plugging this swing directly into the wall or using batteries if it's more convenient. The Swyngomatic sold millions, catapulting Graco to become a leader in manufacturing juvenile products in the process. Since then, Graco has set the industry standard with products like the Pack N' Play and the Travel System. Graco is one of the world's best known and most trusted juvenile products companies. Product safety, quality, reliability, and convenience are their main sources of pride, and are recognized by parents and parenting authorities alike. Swing seat doubles as a bouncer. Can plug-in or use batteries. Features vibration setting with 2 speeds. 6 different swing settings. Includes 10 melodies and 5 nature sounds.